Its been a while since I've posted new recipes. So, after a long gap here are few North Indian mango pickles that you should try making at home while the kairis are still available in the market. Peel the raw mangoes and remove the seeds. Grind fennel, mustard and cumin seeds together but keep them coarse. 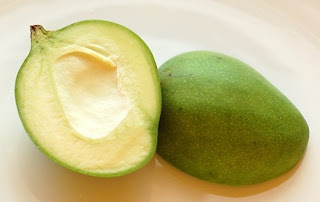 Mix with the mangoes with rest of the ingredients and keep it in a jar. Add one spoon mustard oil and half ltr water and keep it for a day. The pickle is ready to eat the next day but make sure you finish it before it is spoiled.